What's it like to live in Sun City Texas? Located within Georgetown, Sun City Texas by Del Webb is an active adult community for residents age 55+. Many recent retirees flock to Sun City Texas in order to enjoy an active adult community full of amenities with beautiful, mild weather and low cost of living. 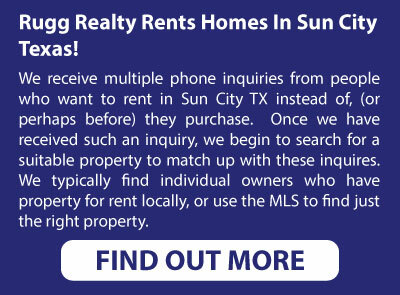 The Sun City Texas Community Association has manicured the community for a classy, resort-like feel, which all of the real estate agents at Rugg Realty enjoy, as each and every one calls Sun City Texas home. Sun City Texas offers a mix of both new and resale homes for sale. 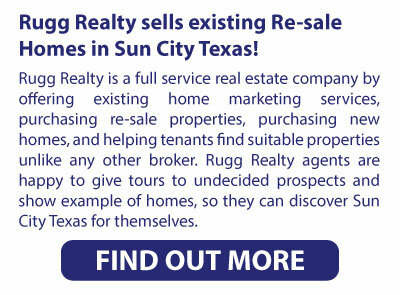 Whether your real estate needs are a small duplex, a rental to try before your buy, or a luxury home with a golf course view, Rugg Realty can help you find your special Sun City Texas home. 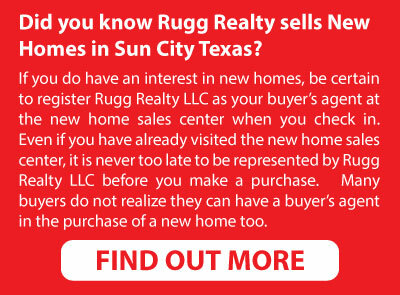 Rugg Realty is the #1 Rated real estate broker in Sun City Texas based on Vendor Book Testimonials! Call us and see how we can make a difference in your home sale or purchase. Rugg Realty LLC is not affiliated with Del Webb or Pulte but we work closely with their staff to assure that you receive the best possible price, and achieve that you are protected along the way. Del Webb's sales organization welcomes you to have your own representation in the purchase of a new home, just ask them.